RareCoins.com is a subsidiary of Austin Rare Coins, Inc., and was founded in 1989 to serve collectors, investors, and Rare Coin Dealers. 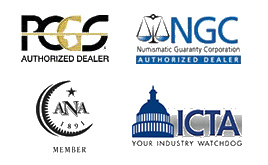 Our staff is devoted to providing our clients with professional advice and high quality U.S. Rare Coins, Silver Dollars, and Gold Bullion Coins at great quality with low, low prices. To find out more about rare coins and what makes a coin valuable download a Free Copy of our Rare Coin Buyer's Guide!